Samuelsson. If you follow the restaurant scene in New York, and want to learn more about one of the most decorated young chefs in the world, check out Aquavit.com and see why Marcus has won awards from Best Chef: New York City to consecutive four star ratings in Forbes Annual best Eateries Issue. exquisite home during our recent stay in Aspen. Merci and namaste, Nancy. 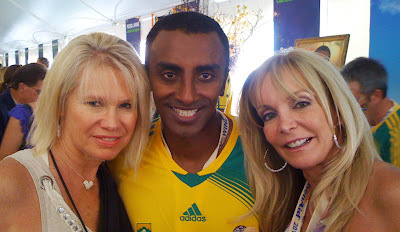 I'm a big fan of Marcus Samuelsson. I saw him on TV one day making a dish from his college days. It was a spicey chicken noodle dish and is now one of my favorites. I do have coconut milk in the cupboard...I know what's for dinner tonight! what a treat to meet him.